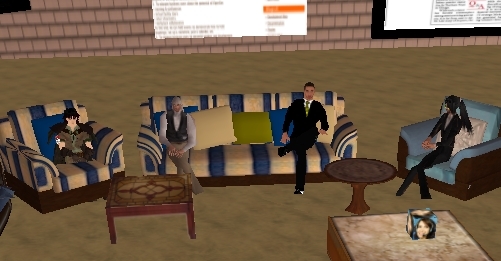 More than a dozen entrepreneurs got together Thursday night — or Friday morning, depending on their time zone — in OSGrid’s Business Center to discuss entrepreneurship on the emerging 3D Internet, or the hypergrid. From left: Ideia Boa, Michael Connolly, RetroDan Dezno, and AradTech Koolkam. Those attending included “Richardus Raymaker,” Jim Siler (“Omar Abdelrahim”), “Vette Chrome”, “RetroDan Dezno”, “Zauber Paracelsus”, “Sim Core”, “Ideia Boa”, Chris Greenwell (“AradTech Koolkam”), “Totally Weird”, Michael Connolly (“ShanghaiX Shex”), “Sherlock Reinard”, “Tiffany Sicling”, and me, Maria Korolov. in my office on the OSGrid, with many of the same people in attendance. “I want to have a place where entpreneurs can meet business owners and can meeet investors and where we can share experiences,” I said. Several of those attending said they felt that OpenSim had evolved to the point where it was ready for entprise use, especially with this week’s release of the ReactionGrid OpenSim appliance. “It is now in reach technically where it was not before,” said Michael Connolly, owner of Shanghai-based community portal Shanghai Expat. Connolly is currently developing Shanghai Planet, a community grid for Shanghai’s English-speaking population. From left: Maria Korolov and Vette Chrome. Another recent development has been the rapid improvement in hypergrid teleportation, allowing people to easily jump between grids. This makes it possible for companies and individuals to run their own grids, and link to related sites, instead of physically being located on the same grid. This was particularly relevant in light of this week’s forced upgrade of OSGrid-based regions, which took many regions down for extended periods of time. OSGrid is the single largest grid running on the OpenSim framework, with over 2,000 regions and more than 17,000 registered users. 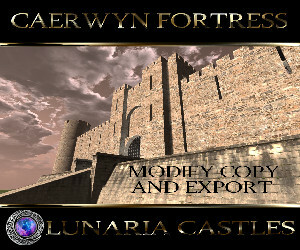 There was significant confusion on Thursday morning, when region owners found themselves unable to connect to the updated OSGrid. Greenwell said he was working on setting up just such a grid. “It will be a business-based grid with stability first,” he said. During the meeting, there were some technical problems. My browser crashed once and I was able to log back in, but a couple of people were logged out and were not able to teleport back to the Business Center region. One of the people who had problems logging back in was Ideia Boa, onwer of the WorldSimTerra grid. WorldSimTerra is a community grid, which includes social aspects, education, and business. Boa is Portuguese, but based in Sweden. The WorldSimTerrra grid has a strong European focus, but also hosts schools from Peru, Mexico and Brasil. There is also in-world economy and currency said Boa, including a central bank. OSGrid’s biggest store owner — Dezno – said that his goal with his stores (which currently give away free virtual goods) is to help create a community of OpenSim users on the OSGrid. Other topics discussed included the state of the hypergate teleportation system, and Tiffany Sicling said that people could come to her regions, at Dradis and Nibiru, and pick of copies of several different kids of working hypergates.